From the moors of northern England to the cities of Western Europe, the poplars of the Thames to the sands of the Nevada desert, the poems in Kidland rise from ancient landscapes to confront a society in denial about its relationship with nature, memory and destiny. On barrows and mountains, in yellow fields and green woods, Kidland offers up a radical, uncompromising vision of broken connections and darkening futures. Images, dreams and prophecies, human and inhuman, dominate the pages of Paul Kingsnorth's debut collection, finding their fullest expression in the narrative title poem, in which reason meets wildness among the dark pines of the north, and certainties are broken like empty promises. Paul Kingsnorth has worked in an orangutan rehabilitation centre in Borneo, as a peace observer in the rebel Zapatista villages of Mexico and as an assistant lock-keeper on the river Thames. He has also worked as a journalist on the comment desk of the Independent, as commissioning editor for openDemocracy and as deputy editor of The Ecologist magazine. He is the author of two non-fiction books: One No, Many Yeses (Simon and Schuster, 2003), an investigative journey through the ‘anti-globalisation’ movement, and Real England (Portobello, 2008) an exploration of the disappearing cultures and landscapes of his home country. His poetry has been published in magazines including Envoi, Agenda, Iota, Reach, The Lighthouse, Staple and nthposition. He won the Poetry Life National Competition in 1998, and was named BBC Wildlife Poet of the Year in the same year. Kidland is his first collection. In 2009, he co-founded the Dark Mountain Project, a literary and cultural movement for an age of ecological collapse and social upheaval. or among sandstone towers in the valleys of the West. 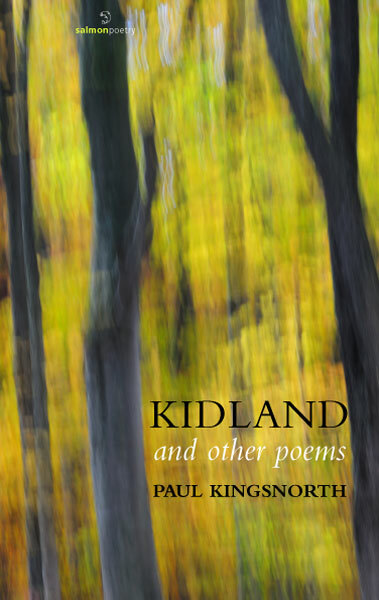 Paul Kingsnorth’s debut collection Kidland and other Poems is nature poetry with teeth. These poems eschew sentimentality or mere description and instead are characterised by radicalism. ‘It is often that I hate my Humanity,’ writes Kingsnorth, yearning for a natural world which is unspoilt by human destruction. In this respect, his poetry is underpinned with a sense of loss as well as anger. as the Earth turns toward the dark. There’s a sense of prophecy here, suggested by ‘waiting,’ and of coming change, of ‘something in the air’ (a title of one of the poems), that will overcome human cruelty. You are clever and hungry and foul breathed. You will kill because you must. I am the stone spirited, the bird killer. Life is distant from me, I am above it. Overusing pronouns makes for an abrasive and aggressive tone. The ‘you,’ which even Kingsnorth admits sounds like an ‘accusation,’ won’t be to everyone’s taste and the rhetoric might be too heavy for those who prefer a lighter tone. Still it raises an interesting discussion on the use of ‘you.’ Is the poet angry with us, or are we the converted? The long narrative poem ‘Kidland’, from which the collection takes its title, is named after the vast man-made forest in Northumberland. This serves as the location for a lone figure, named Roland, who tries to live in a ‘utopia of one,’ but his experiment fails when he is killed at the end. Perhaps Roland, if you excuse the pun, is kidding himself that he can find a world that has been lost. Is this poetry of a lone and alienated voice? on equal terms, on anything like equal terms. I am grateful for the warmth of these hands. As a minor point I’m not fully convinced by the line endings here. In terms of imagery, however, there is something rather moving about a man cradling a dying bird in his hands, with ‘its feathers’ coated in ‘the dark beauty of an oil slick.’ Here, it is almost as if Kingsnorth suggests there can be some reconciliation between humans and other living beings, and perhaps through poetry this can be realised. What struck me about Kingsnorth is his vibrancy and strength of opinion. This isn’t somnambulant poetry about making dinner or being a teenager with a broken heart; this is poetry which exhibits powerful and radical opinions about ecology. As for the quality of writing, the register remains fixed throughout and perhaps the writing needs to enjoy language more and play with meanings, sounds and form. Nevertheless it is worth applauding Kingsnorth for making poetry an active force for change, even if ‘utopia’ has not yet been realised. Eyewear is a British blog that looks at Poetry, Pop Culture, and Politics, in the Digital Age. It is edited by Todd Swift, and was started June 2005. It averages over 22,000 hits a month, and is archived by the British Libary.